Ibbetson, Ernest. "The London Cyclists," 1912. ©IWM, Art.IWM PST 0873. "The London Cyclist Battalion patrolled the coast of England to watch for a German invasion. After air attacks began in May 1915, bicyclists with signs "Take Cover" warned British citizens to find shelter." Parker-Galbreath notes that, while cyclists served on the battlefront as part of the British Army, the London Cyclists were an important part of homefront defense during the war years and eventually were dispatched to battlefields in the Middle East and India. There, they would continue to serve through the Great War's end until being demobilized in 1919. The 25th London website includes PDF images of the Battalion's periodical, The Londoner. It appears that this journal was published in India for battalion troops stationed there from 1916-1919. 25th London Cyclists Badge, ca 1908-22. © IWM, Item INS 7264. The energy of the men in the poster, who have sprung from their cycles and stand poised for battle, is extremely compelling and somewhat disturbing. The troops stand with a quaint village behind them, placing themselves on the front lines of combat--between home and an English past, we might say, and an unknown and unnamed, but menacing, future. Their enemy is invisible, the threat it poses is unclear and unsettlingly vague. That the poster was created in 1912 suggests that a modern conflict was already sensed on the horizon, its reach feared powerful enough to touch English soil and shape the new century. Even at this early date, for our ghosts of 1914, war was already, chillingly, a phantom coming into view. It's always so great to find an archival item just brimful of energy. This poster jumped out at me for exactly that reason amid a more general search of the Imperial War Museum's great Collections Database. The image features a bright and confident young woman waving to the (presumably) female viewer, as if to summon her over to the ranks of the many happy and hearty looking ladies assembled behind her. The billowing British flag adds to a feeling of motion and dynamism here. The uniformed bodies that touch one another to form a more unified mass of Women's Army Auxiliary Corps members convey integrity and solidified strength. With such a cheerful and compelling figure to welcome us, how could we resist the call to "release a fit man" for service? For readers inspired by the above image, the IWM's "Women's War Work During the First World War" site is an excellent resource. It's full of information and artifacts illustrating many aspects of women's experience and service. Happy Valentine's Day to my readers! In honor of the day, I wanted to put together a post about the history of chocolate in the Great War. Information on the kinds of chocolate distributed to soldiers in the British Army is not as easy to come by as I assumed, so this will be a work in progress. For now, though, I can offer this image from the Suburban Birmingham Project, a history website featuring various artifacts relevant to Birmingham, England's past. In it, female employees of Cadbury's Chocolate pack boxes with chocolate and books for soldiers. Cadbury employees assembling packages for soldiers, ca. 1915-18. "As soon as war broke out and troops were deployed overseas, Cadbury Bros began producing ‘chocolate for the troops’. These gifts continued to be distributed throughout the duration of the war and in total 20,000 parcels were sent out to troops on the front, as well as to those who were wounded and recovering at home or in hospital." Chocolate was seen as a valuable gift to soldiers for many reasons. Though we bemoan this reality today, the confection supplies a boost of sugar and calories, which could help revive a hungry or fatigued soldier. It is also a source of comfort and/or pleasure, a small pick-me-up for a hospital patient, for instance. After the war, Cadbury's purchased what was probably its greatest competitor in the commercial chocolate "wars," Fry's Cocoa. Both companies had been started by prominent Quaker families of Northern England. Slightly older than Cadbury's, having been founded in the eighteenth century, J.S. Fry and Sons, Ltd. was based in Bristol, England. In 1919, the two cocoa titans merged together as the British Chocolate and Cocoa Company. Another interesting aspect of Cadbury's history is the model village of Bournville, built in Birmingham during the late Victorian period by George and Richard Cadbury. Ground-breaking for its time, the village was intended to support a wholesome lifestyle for factory workers. It included housing, schools, museums, churches, and sporting arenas, offering access to safe and healthful conditions and activities for those who worked in the Cadbury factories. The bulk of construction was completed by the time of the Great War, although the village continued to expand into the twentieth century. Well, it is time to sign off for the moment. Do enjoy some chocolate or cocoa in honor of the holiday or simply in honor of the history of this confection and its importance to the Ghosts of 1914. A brief post today to remember Florence Green, the last surviving veteran of the Great War. She passed away a few days ago in Norfolk, England, at the age of 110. Mrs. Green joined the then-newly founded Women's Royal Air Force (WRAF) during the last months of the war, in autumn of 1918. As a war worker, she served meals to officers at the RAF Marham base and at Narborough airfield. The BBC has a video of Mrs. Green talking about her experiences, along with further details about her life. 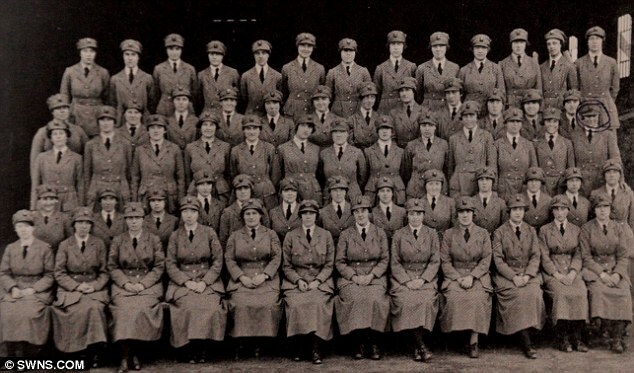 Photo of Florence Green with her WRAF service corps at Narborough airfield, 1918. With Green now gone, along with Claude Choules (the last male British veteran), Harry Patch, and Frank Buckles (the last American veteran), who also made up the small company of longest-lived veterans, we have entered a new era. The experience of the Great War is no longer among the living but now lives in memory. It is a momentous thing for a war to pass fully from recall to record. It is important, in the face of such an inevitability, to preserve the human hold on history and to maintain our perspective on the events of the Great War such that we understand (or try to understand) what it meant to live through it--so that the nature and costs of such a conflict remain human-scaled, even at a vantage point of a hundred years away. I feel that it is only with such a perspective that the history of war can point to peace. In the spirit of maintaining a human hold on history, I urge you to seek out the recollections of family and friends. NPR's StoryCorps project offers an inspirationally wide array of recorded personal stories, some of which are about combat experience. Ask an elder in your community to tell you about his or her memories. Take notes and ask questions. Bring a tape recorder. I guarantee you a fascinating chat, whether you talk of war and peace or cabbages and kings. "Hello! My Dearie" Valentine, British Postal Museum & Archive. Hello, my dear readers. I feel like I'm writing here after too long an absence, reaching out across the chasm that a dissertation and related duties sometimes create between oneself and one's more personal projects. This entry is a way of bridging that gap, of reconnecting to you and to the "Ghosts of 1914." In honor of such technological reconnection and in honor of the upcoming yearly feting of love in all its forms, I offer you the above Valentine. What a wonderful image we have here, from the collections of the British Postal Museum and Archive, which happens to have a great online exhibition about the Great War's impact on the Postal Service. The couple represented in the Valentine are separated by a rather pleasant looking body of water, which we can assume is the English Channel between Britain and France. The sun glints peacefully under the (absolutely delightful) "Hello" spelled by the telephone wire that connects the soldier and his lovely lady. More than just wide blue waves sets the man apart from his mate, however, with his spartan wooden table, uniform, and situation in a bunker contrasting sharply with the woman's diaphanous white gown and dainty heels, her strand of pearls and blue sash, and the comfortable domestic setting in which she sits. Front and home are signified in all of these ways--war and peace as well, we might imagine. There is even an interesting fantasy of complete focus--we don't see the war "behind" or "around" the soldier, nor do we see any of the signifiers of responsibility, anxiety, or distraction in the woman's realm. The telephone somehow serves to isolate the two lovers, bringing them close and dulling the sights and sounds that would remind them of their distance. He leans his ear against the telephone receiver, eyes fixed on some vision beyond his situation--presumably picturing what we see on the right side of the postcard: the woman with her ear pressed equally attentively to the receiver as she speaks into the mouthpiece, her whole posture and expression signifying that she is fully dedicated to this communication. The verse that appears here is somewhat poignant, suggesting the anxious choppiness of an early twentieth century telephone call, with a pleading and emotional message broken into somewhat fitful phrases, all of which are initiated and completed within an incredibly short span of time. There seems to be no time or words to spare, whether because of the vicissitudes of combat or of the telephone. It must have been quite strange to connect in this way during the Great War and hear the voice of a soldier or a loved one at home come crackling over the wire. No doubt this was a rare privilege for those on either side of the conversation. Here, though, whatever its oddities, the telephone line is imagined as a sort of lifeline, channeling emotion across a great divide and transmitting much more than sound or information. Words, feeling, and modern technology combine in a very touching and fascinating soldier's Valentine here. Until next time, when we (at the very wise suggestion of my mother) again mark the upcoming holiday with a look at the history of chocolate in the war, we'll hang up for now and leave these two ghosts of 1914 to their telephonic love-talk.